REDUCED PRICES - FT/FS: Soaps, Mugs, Brushes, etc. WILL ADD EITHER RAZOROCK OR ARKO TO ANY PURCHASE FOR $2.00 FOR EITHER ONE. I've collected more stuff than I can ever use, so I want to trade/sell a bunch of stuff. I'll consider more than one of my items for something I'm interested in or adding my cash or yours. Prices include CONUS shipping,international can contact me . SOLD Old Spice “Early Glass Mug 01” - the first of the glass Old Spice mugs probably made in around 1948... you can tell it's the earliest model as it doesn't have the “ribs” on the inside bottom of the mug. Has the “Ship Friendship” on it. These aren't cheap to ship, so $18 shipped. 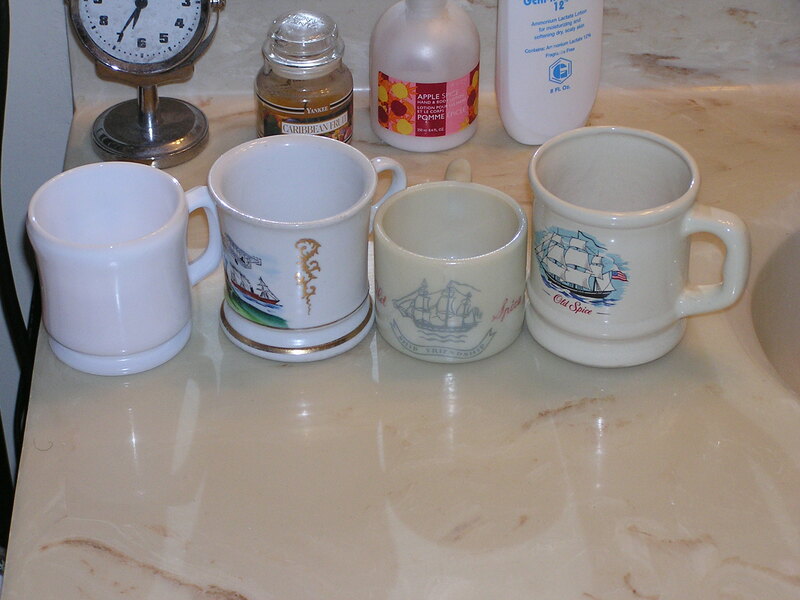 These four shave soaps in the back row are inexpensive enough that I'll only use them as part of atrade or as add-ons. 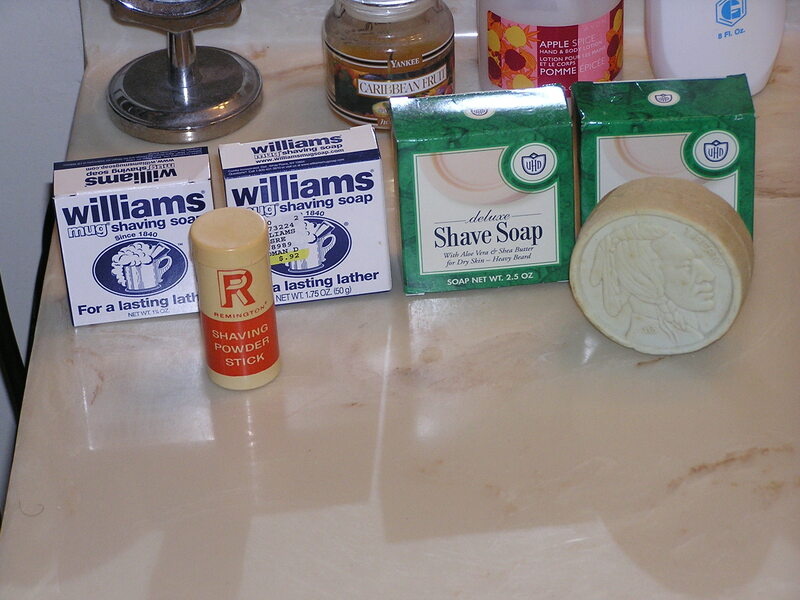 First two are Williams shave soaps, new and unused – These can be part of a trade or I'll add them on to another sale or trade for $1.25 each. Next two are VanDerHagen (VDH) Deluxe shave soaps – These can be part of a trade or I'll add them on to another sale or trade for $1.25 each. The De Vergulde Hand soap and the Old Spice “Early Glass Mug 01" are sold. PM sent for Proraso Sandalwood soap 95% $9.00. 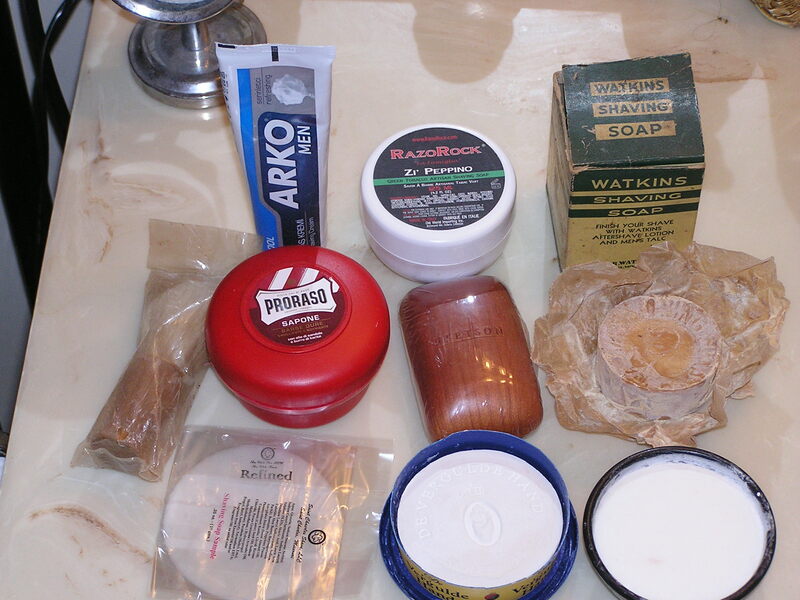 Will include Arko or Razorock with any other purchase for $2.00 for either one.